« C++ Renaissance? I’m not so sure. I was excited to see that Xcode 7 would include a test recorder that could generate test code in the same language as my app. I just got done kicking the tires (better late than never), and the results were… mixed. I want to record my results here while they’re fresh in my mind in case anybody else runs into the same issues I did (including my future self). I won’t be winning any Apple Design Awards with this one. 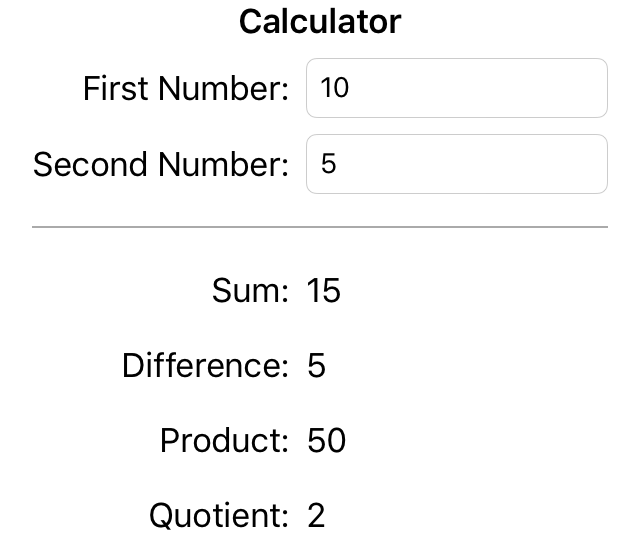 I made a simple 4-function calculator app for one of the exercises in Brian Hogan’s Exercises for Programmers: 57 Challenges to Develop Your Coding Skills. Basically it takes two numbers as inputs, and spits out their sum, difference, product, and quotient. Input 10 and 5 (just like in the book) and verify the outputs. Very straightforward. Input 5 and 10; verify outputs. 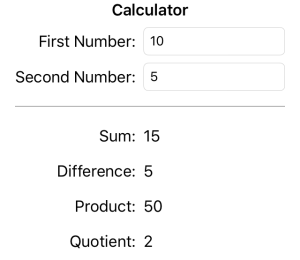 There are a couple interesting cases here: 5 - 10 is a negative number, and 5 / 10 is a decimal. Input foo and bar; verify the app refuses to operate on such garbage. In a real app, I might display an informative error message, but for this simple app I just want the outputs to go blank. The inputs are referenced by index, meaning this test code will break if another field is ever added. The outputs are referenced by the values they contain. That’s not horrible in this instance, but certain inputs might lead to the same value in multiple outputs. For example, 1 * 1 and 1 / 1 both result in a 1 output. We really should reference the fields by some sort of unique identifier, then verify the results they contain. Which accessibility option is the right one? I went with Label, and had some initial success, but it ended up causing problems later. It turns out Identifier is the correct option. And if you do choose Label, you’ll end up having to repair it later (like I did). And let’s run this thing! UI Testing Failure – Neither element nor any descendant has keyboard focus. And finally, we have a passing test! The other test cases can be created trivially by modifying this case. Somewhere in this little adventure, I did a “Reset Content and Settings” in the simulator, and the test broke. That first attempt to access input1 would fail. Eventually I ran the app normally (not in test mode) and filled in the fields manually. After that, I was able to run the test successfully again. Now I’m unable to reproduce that problem, so hopefully it was just a fluke and others won’t run into it. But if you do, try stepping through your test manually. It might help. This entry was posted on Sunday, October 4th, 2015 at 1:06 am	and is filed under iPhone/iPad/iOS, Software Development. You can follow any responses to this entry through the RSS 2.0 feed. You can leave a response, or trackback from your own site.